Description: If your skin is exposed to excessive sunlight, it gives rise to DNA damage within your skin. Enriched with the goodness of chickpea, rice,almond, turmeric and roses, you can easily gain back your natural skin tone with the eradication of pigmentation in the skin layer. Directions to use - Use cold or lukewarm water to wet your skin. 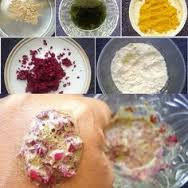 Add milk or rose water to the powder scrub. Massage your skin gently with the facial scrub for 1 minute. Slowly rinse the scrub off your face. Dry your skin. Use the scrub only once or twice per week. For best results moisturize after using the scrub.Its nature's best untold beauty recipes.